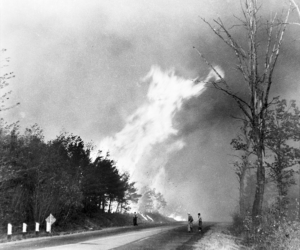 Due to the lasting impact of the widespread forest fires of 1947, Maine lawmakers addressed life safety concerns with the passing of legislation requiring fire extinguishers and appropriate means of egress in businesses and public buildings as well as public education in fire prevention. In 1954, a percentage of the already taxed insurance premiums were earmarked for the administration of fire laws, regulations and educating the public in fire safety. Three years later, the first appropriations made for firefighter training were added to this Statute. Today, 75.7% of these taxes are for the same purposes with almost 25% of total goes directly to fire training and education of firefighters in Maine and is managed by the Maine Fire Marshal through the Office of Public Safety. Maine Fire Service Training, now known as Maine Fire Service Institute, began its journey in 1958 as a division of the Maine Department of Education and is now a department of Southern Maine Community College. It came to be because a group of dedicated individuals and groups were able to come together for the benefit of Maine’s firefighters and citizens. It was governed by an advisory committee made up of Maine fire chiefs, members of the Maine Federation of Firefighters, insurance underwriters and other municipal and Department of Education members, quite similar to the advisory committee of today. These members were appointed by their respective organizations and were groundbreakers that not only realized the need to train Maine’s firefighters but also to train their officers in the areas of firefighting tactics, administration and leadership. This groups highest priority was not the number of students trained but the quality of the education they received, a mission we still hold today.